Since 1974, when the current wave of democratisation began, the movement towards democracy in Asia has remained limited. Many countries in Asia, in fact, are not making a decisive move towards democracy, and find themselves struggling with the challenges of democratic consolidation and governance. Focusing on Indonesia, Thailand and Korea, this book analyses why democratisation is so difficult in Asia. The book investigates the dynamics by which citizens embrace democratic rule and reject authoritarianism, and also compares these dynamics with those of consolidating democracies around the world. The book looks at the forces that affect the emergence and stability of democracy, such as elite interactions, economic development and popular attitudes as beliefs and perceptions about the legitimacy of political systems have long been recognised as some of the most critical influences on regime change. The book also discusses what it is about the nature of public opinion and the processes of day-to-day democratic participation that have made these countries vulnerable to repeated crises of legitimacy. 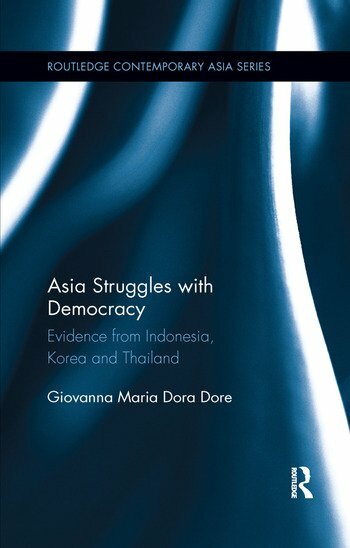 Using Indonesia, Korea, and Thailand as case studies, this book highlights the uniqueness of the Asia’s path to democracy, and shows both the challenges and opportunities in getting there. The book will be of interest to students and scholars of Asian Politics, Comparative Politics and International Studies. Giovanna Dore is a Fellow in the Paul H Nitze School of Advanced International Studies at Johns Hopkins University, USA.